SEOUL--(Korea Newswire) October 27, 2016 -- In celebration of the first Asian edition of the world renowned amateur cycling series ‘2016 L’Étape Korea by le Tour de France’, a cultural festival titled ‘Village’ will be hosted. 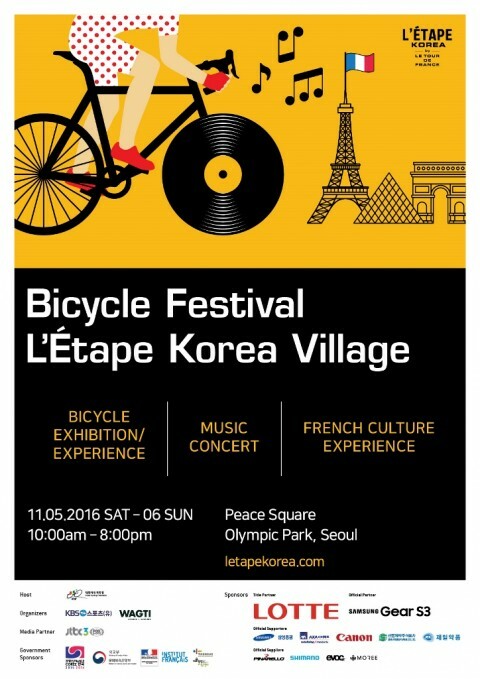 The ‘Village’ is a cultural festival to raise awareness of cycling and French culture with performance by popular K-pop artists held from November 5th through 6th at the Olympic Park, Seoul. By keeping the tradition of hosting a grand festival at the starting point of the world’s prestigious cycling event ‘le Tour de France’, the ‘Village’ will consist of meaningful events in celebration of the Year of Korea-France Mutual Exchange. In addition, title partner Lotte and official partner Samsung Electronics will be engaging in the ‘2016 L’Étape Korea ‘Village’. The two partners will be offering abundant events for participants of the race and festival. As the festival is held to celebrate the first ‘L’Étape Korea’, the three time defending champion of Tour de France (2013, 2015, 2016) Chris Froome will be signing autographs at the fans’ meet-and-greet. Moreover, a virtual experience program that allows event-goers to ride a section of ‘le Tour de France’ using roller-trainer will be available as well as customized cycling classes for beginners to master levels. In addition, the festival will offer a variety of programs such as making cotton candies with a bicycle generator and a mini cycling race for children - offering an enjoyable cycling festival for men and women across all ages. Meanwhile, numerous singers will be performing at the ‘Village’ to light up the festival spirit. In both evenings of the ‘Village’, a concert of the ‘Antenna Angels’ will be held featuring young artists of Antenna Music Entertainment including Jina Kwon, Sam Kim, Jina Lee, and Seunghwan Jung. Furthermore, various busking stages of indie bands such as ‘Sunday Park’ and ‘YKSI’ are lined up to hype up the festival’s atmosphere to the next level. As ‘L’Étape Korea’ is supported by Embassy of France in Korea in celebration of the 130th diplomatic anniversary of Korea and France, various French cultural experience programs will also be provided. These programs include cultural performances by the students of French School of Seoul, French embroidery and knitting lessons, making of the Eiffel Tower, and a chanson performance. Also, a food zone will be available where event-goers can taste exquisite French cuisine as France is renowned for its long-held gastronomic traditions. “In celebration of the launch of ‘L’Étape Korea’, we have prepared a cultural festival of bicycle where anyone can participate in order to spread and expand the bicycle culture”, said Hoon Kang, CEO of WAGTI. “As the race is a global competition where 15 different nationalities including Korea are participating, a variety of cultural experience events will be prepared for diverse people to enjoy. Visitors can freely come to the Olympic Park and experience French culture, enjoy the stage of artists of Antenna Music Entertainment and be much familiar with bicycle,” stated Kang. “It is our pleasure and honor for us to be able to participate in ‘L’Étape Korea’ as the title partner”, stated a spokesman of Lotte. “We anticipate in strengthening an amicable relationship between Korea and France through this event and to expand the base of bicycle culture in Korea”. ‘Village’ is free of admissions where both participants of ‘L’Étape Korea’ as well as visitors of the Olympic Park can freely join. For more information about the ‘2016 L’Étape Korea Village’, visit its official website at www.letapekorea.com, Facebook www.facebook.com/LEtapeKorea , and Instagram @ letapekorea. Le Tour de France is the world’s most prominent cycling race that started in 1903, known for the 3,500km race that climbs the uphill of Mont Blanc, the highest peak of Alps, and races alongside the Normandy beach. A.S.O., the organizer of the Tour de France, developed an amateur cyclosportive event, L’Étape du Tour, allowing amateur cyclists to ride in the same conditions as the professionals of the Tour de France and experience the journey. L’Étape du Tour, is open to anyone who likes riding on the same routes which are entirely closed to traffic. Celebrating the 130th diplomatic anniversary of Korea and France, a two-day amateur cycling event - ‘L’Étape Korea by le Tour de France’ will take place in Korea at Seoul Olympic Park from November 5th to 6th. The official race event will be hosted on November 5th, passing on the vibe of ‘Le Tour de France’ to three thousands amateur cyclists and ride the stage with professionals. Also, an engaging sports festival to be held on the first day that aims to promote cycling and French culture, will take place from November 5th to 6th, with various entertainments - a cycling expo, French culture experience zone, opportunity to meet professional cyclists and more. The sponsors for ‘2016 L’Étape Korea’ are Lotte (title sponsor), Samsung Electronics (official partner), Samsung Securities, AXA Direct Insurance, Canon, Shin Poong Pharm, Jeil Pharmaceutical (official supporters), Pinarello, Shimano, Evoc, Moree (official supporters). Amaury Sport Organisation is a company that owns, designs and organizes top international sporting events. Specialised in the ‘non-stadia’ events, it has in-house knowledge of professions linked to organisation, media and sales of sports events. A.S.O. organizes 270 days of competition per year, with 70 events in more than 20 countries. www.aso.fr Present in five major sports including cycling with Le Tour de France, motor sports with Le Dakar, golf with the Open de France, sailing with Le Tour de France à la Voile and mass events with the Schneider Electric Marathon de Paris, Amaury Sport Organisation is a subsidiary of a French media group, the Amaury Group.